I received this one upon returning from holiday, just the other day, and devoured it instantly (or at least within the morning). Yes, the third novel in Jackson's tale of an alternate pre-revolutionary America is here - and yes, it's just that good. But first, some background. I've been following the Thieftaker series since its inception. It's an intriguing blend of historical fantasy and crime, taking as its central changes that thieftakers were active in the American colonies (they weren't), and that magic, in the form of conjurors existed. And needless to say, it's a very fun one. Our protagonist is one Ethan Kaille, a thieftaker and conjuror in Boston, where revolution is fermenting, tensions are high, and now the smallpox has come to town. Still struggling against the emnity of the other thieftaker in town, the far more influential Sephira Pryce, he consistently finds himself in desperate straits - which, of course, makes for rather excellent fiction. This time, the conjuration takes centre stage from the beginning. Someone has been graverobbing, in a bizarre ritualistic fashion that clearly ties the victims to Ethan himself - and more, his own powers are beginning to wane. Shades are appearing across town, Sephira's after him, and Ethan will need to enlist far more help to win against this arcane threat - while his allies are divided. While there's a fourth book on the way from Jackson, A Plunder of Souls is clearly an escalation, if not a climax. And it's all the better for it. Where interesting characters like Janna (owner of the local magic supply shop, and frequently ill-tempered advisor - also the book's main POC character) and Sephira had been sidelined, now they play major and far more complex parts. Sephira in previous books had played the bullying rival with much less depth, and while I enjoyed them, I felt this was a missed opportunity. In A Plunder of Souls, she's forced to work more with Kaille, and we see other sides of her, and it makes for a wonderful read, one that leaves me anticipating their interactions in the next book. A Plunder of Souls also delves less into the crime element than its predecessors, which is both a strength and a weakness. Because of the focus on conjuration, a system that had previously felt... light has ended up far more substantial and convincing. But it also develops a clear culprit earlier on, who occasionally verges on failing the Evil Overlord List (okay, they're not that bad, and I like them as a character - but after so many blunders on their part, it becomes a little too plot convenient to forgive entirely). That said, the threat is definitely more substantial, and that's a good thing, preventing the series settling into too great a pattern. As in previous books, the historical setting is a major asset. Despite the two central changes, the novels otherwise stick fairly close to history (even timing the smallpox outbreak), and it's a wonderfully convincing thing. In addition, it's practically unique in fantasy. I might have missed a vast set of pre-Revolution Boston fantasies, but I'm pretty sure I'm right on this one - which of course, makes it refreshing, especially given it's also urban fantasy and is thus able to depart far from the conventions of the genre. It also eschews many of the romantic elements (especially those that can turn a little creepy/sexist - see some of the later Dresden Files books), though mainly as Kaille is in a happily monogamous relationship with a local innkeeper. It's a nice genre-blend, and I personally love it (though I've always enjoyed historical fantasy, especially Kay). 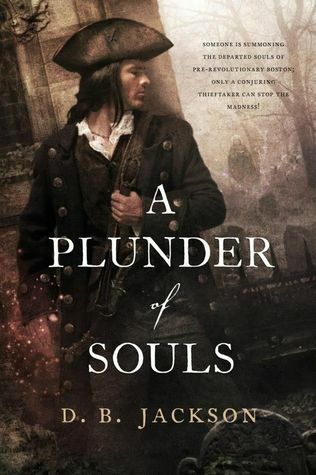 Overall, A Plunder of Souls is an enthralling read - an addition that elevates a good series to a great one, and can only leave me in anticipation for the sequel. While it suffers from an overly villainous antagonist, its few flaws are massively outweighed by its good points: Ethan's intriguing allies (and their development), a wonderful setting, and a fleshed out magic system. Definitely recommended! ...But read the others first, I'd say - while this one's definitely readable from scratch, you'll miss a lot of the context. This novel has a very interesting meson, whose study not only does not bother humans, but as a human movie waits for what happens in the next sequence.